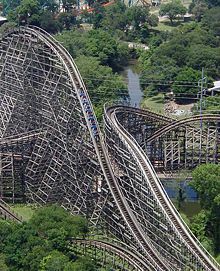 The cars of a roller coaster reach their maximum kinetic energy when at the bottom of their path. When they start rising, the kinetic energy begins to be converted to gravitational potential energy. The sum of kinetic and potential energy in the system remains constant, assuming negligible losses to friction. The kinetic energy of an object is the extra energy it possesses due to its motion. It is defined as the work needed to accelerate a body of a given mass from rest to its current velocity. Having gained this energy during its acceleration, the body maintains this kinetic energy unless its speed changes. To return the body to a state of rest from that velocity, negative work of the same magnitude would be required. Kinetic energy for single objects is completely frame-dependent (relative). For example, a bullet racing by a non-moving observer has kinetic energy in the reference frame of this observer, but the same bullet has zero kinetic energy in a reference frame that moves with the bullet. The kinetic energy of systems of objects, however, may sometimes not be completely removable by simple choice of reference frame. When this is the case, a residual minimum kinetic energy remains in the system as seen by all observers, and this kinetic energy (if present) contributes to the system's invariant mass, which is seen as the same value in all reference frames and by all observers. The kinetic energy of flowing water or the wind can be used to move turbines, which in turn can be used to generate electricity. The adjective "kinetic" has its roots in the Greek word κίνηση (kinesis) meaning "motion." The same root is used in the word cinema, referring to motion pictures. The principle in classical mechanics that E ∝ mv² was first theorized by Gottfried Leibniz and Johann Bernoulli, who described kinetic energy as the "living force," or vis viva. Willem 's Gravesande of the Netherlands provided experimental evidence of this relationship. By dropping weights from different heights into a block of clay, 's Gravesande determined that their penetration depth was proportional to the square of their impact speed. Émilie du Châtelet recognized the implications of the experiment and published an explanation. The terms "kinetic energy" and "work" with their present scientific meanings date back to the mid-nineteenth century. Early understandings of these ideas can be attributed to Gaspard-Gustave Coriolis, who in 1829 published a paper titled Du Calcul de l'Effet des Machines, outlining the mathematics of kinetic energy. William Thomson, later Lord Kelvin, is given credit for coining the term "kinetic energy," around 1849-1851. There are various forms of energy, including chemical energy, heat, electromagnetic radiation, nuclear energy, and rest energy. They can be categorized in two main classes: potential energy and kinetic energy. Kinetic energy can be best understood by examples that demonstrate how it is transformed to and from other forms of energy. For example, a cyclist will use chemical energy that was provided by food to accelerate a bicycle to a chosen speed. This speed can be maintained without further work, except to overcome air-resistance and friction. The energy has been converted into kinetic energy—the energy of motion—but the process is not completely efficient and heat is also produced within the cyclist. Alternatively, the cyclist could connect a dynamo to one of the wheels and also generate some electrical energy on the descent. The bicycle would be traveling more slowly at the bottom of the hill because some of the energy has been diverted into making electrical power. Another possibility would be for the cyclist to apply the brakes, in which case the kinetic energy would be dissipated through friction as heat energy. Like any physical quantity that is a function of velocity, the kinetic energy of an object depends on the relationship between the object and the observer's frame of reference. Thus the kinetic energy of an object is not invariant. Spacecraft use chemical energy to take off and gain considerable kinetic energy to reach orbital velocity. This kinetic energy gained during launch will remain constant while in orbit because there is almost no friction. However, it becomes apparent at re-entry when the kinetic energy is converted to heat. Kinetic energy can be passed from one object to another. In the game of billiards, the player gives kinetic energy to the cue ball by striking it with the cue stick. If the cue ball collides with another ball, it will slow down dramatically and the ball it collided with will accelerate to a speed as the kinetic energy is passed on to it. Collisions in billiards are effectively elastic collisions, where kinetic energy is preserved. Flywheels are being developed as a method of energy storage (see Flywheel energy storage). This illustrates that kinetic energy can also be rotational. There are several different equations that may be used to calculate the kinetic energy of an object. In many cases they give almost the same answer to well within measurable accuracy. Where they differ, the choice of which to use is determined by the velocity of the body or its size. Thus, if the object is moving at a velocity much smaller than the speed of light, the Newtonian (classical) mechanics will be sufficiently accurate; but if the speed is comparable to the speed of light, relativity starts to make significant differences to the result and should be used. If the size of the object is sub-atomic, the quantum mechanical equation is most appropriate. where m is the mass and v is the speed of the body. In SI units (used for most modern scientific work), mass is measured in kilograms, speed in metres per second, and the resulting kinetic energy is in joules. Note that the kinetic energy increases with the square of the speed. This means, for example, that an object traveling twice as fast will have four times as much kinetic energy. As a result of this, a car traveling twice as fast requires four times as much distance to stop (assuming a constant braking force. See mechanical work). v is speed of the center of mass of the body. The kinetic energy of any entity is relative to the frame of reference in which it is measured. An isolated system (no energy can enter or leave) has a total energy which is unchanging over time as seen by any one observer. Thus, the chemical energy converted to kinetic energy by a rocket engine will be divided differently between the rocket ship and its exhaust stream depending upon the chosen frame of reference. But the total energy of the system (including kinetic energy, fuel chemical energy, heat energy, etc), will be conserved over time in a given reference frame, regardless of the choice of measurement frame. However, different observers will disagree on what the value of this conserved energy is. In addition, although the energy of such systems is dependent on the measurement frame, the minimal total energy which is seen in any frame will be the total energy seen by observers in the center of momentum frame; this minimal energy corresponds to the invariant mass of the aggregate. The calculated value of this invariant mass compensates for changing energy in different frames, and is thus the same for all frames and observers. A system of bodies may have internal kinetic energy due to macroscopic movements of the bodies in the system. For example, in the Solar System the planets and planetoids are orbiting the Sun. The kinetic energy of a system at any instant in time is the sum of the kinetic energies of the bodies it contains. A body that is stationary and not rotating nevertheless has internal energy, which is partly kinetic energy, due to molecular translation, rotation, and vibration, electron translation and spin, and nuclear spin. When discussing movements of macroscopic bodies the kinetic energies referred to are usually those of the macroscopic movements only. Thus the kinetic energy of a system is lowest with respect to center of momentum reference frames, i.e., frames of reference in which the center of mass is stationary (either the center of mass frame or any other center of momentum frame). In any other frame of reference there is additional kinetic energy corresponding to the total mass moving at the speed of the center of mass. The kinetic energy of the system in the center of momentum frame contributes to the invariant mass of the system, and this total mass is a quantity which is both invariant (all observers see it to be the same) and is conserved (in an isolated system, it cannot change value, no matter what happens inside the system). If a body's speed is a significant fraction of the speed of light, it is necessary to use relativistic mechanics (the theory of relativity as expounded by Albert Einstein) to calculate its kinetic energy. where m is the rest mass, v is the object's speed, and c is the speed of light in vacuum. The equation shows that the energy of an object approaches infinity as the velocity v approaches the speed of light c, thus it is impossible to accelerate an object across this boundary. So, the total energy E can be partitioned into the energy of the rest mass plus the traditional Newtonian kinetic energy at low speeds. For example, for a speed of 10 km/s the correction to the Newtonian kinetic energy is 0.07 J/kg (on a Newtonian kinetic energy of 50 MJ/kg) and for a speed of 100 km/s it is 710 J/kg (on a Newtonian kinetic energy of 5 GJ/kg), etc. What this suggests is that the formulas for energy and momentum are not special and axiomatic, but rather concepts which emerge from the equation of mass with energy and the principles of relativity. ↑ Crosbie W. Smith and Matthew Norton Wise, 1999, Energy and Empire: A Biographical Study of Lord Kelvin. (Cambridge, UK: Cambridge Univ. Press. ISBN 0521261732). ↑ John Theodore Merz, 1965, A History of European Thought in the Nineteenth Century. Reprint. New York: Dover. OCLC 67597903. ↑ Center of Mass Reference Frame. Duke University. Retrieved February 25, 2009. ↑ Kinetic Energy in the CM Frame. Duke University. Retrieved February 25, 2009. ↑ In Einstein's original Über die spezielle und die allgemeine Relativitätstheorie (Zu Seite 41) and in most translations (e.g. Relativity - The Special and General Theory) kinetic energy is defined as . Retrieved February 25, 2009. All links retrieved April 17, 2018. Gaspard-Gustave de Coriolis (1792-1843). (Biography.) School of Mathematics and Statistics, University of St Andrews. 2000. This page was last modified on 17 April 2018, at 14:38.